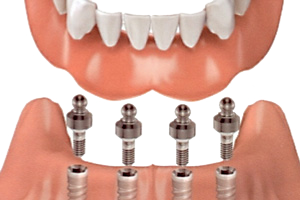 Dental implants have many advantages over other methods of teeth replacement. Dr. Radu can explain these to you in a free dental implant consultation. Excellent dental restorations that act, look and feel like real teeth! A dental implant is a replacement tooth that simulates a real tooth in function, appearance and sensation. A bio-friendly titanium post is inserted into the empty tooth socket after a tooth has been extracted, or directly into the jawbone, and is then capped with a crown. Dr. Radu plans the dental implant placement procedure using 3D X-rays. 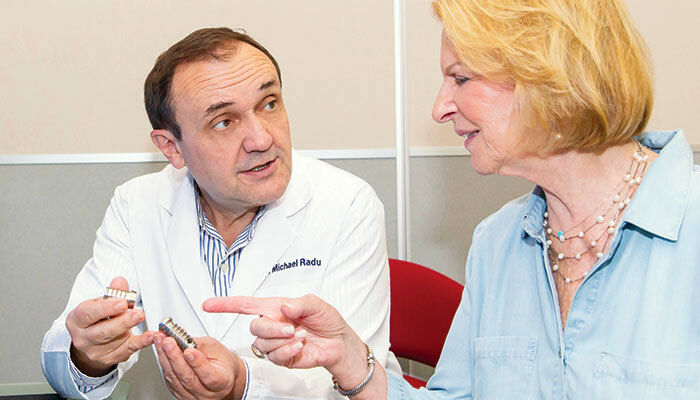 Dr. Radu has been placing and restoring implants since 1988. He has trained extensively at prestigious institutes, including the Misch International Implant Institute, and has continued to take many courses, staying up-to-date on the latest in dental implant technology. With Dr. Radu, you won’t have to go to another office to complete your implant treatment. He does the entire process here in the office, from diagnosis to final restoration. Review your options for replacing your missing teeth during a consultation with Dr. Radu. In the past, patients with insufficient bone, or those with certain health conditions or habits, were not considered candidates due to difficulty in implant placement or the potential risk involved. Developments in bone grafting and bone reconstruction, as well as the minimally invasive nature of modern implant placement, have made it so that most patients can receive implants. Additionally, there are now implant procedures that can bypass the need for bone grafting, making implant treatment faster and more affordable than ever. People who smoke, or who have conditions such as diabetes, can also be treated safely. However, the success rate is reduced slightly due to their impaired ability to heal. Dental implants use titanium, a non-corrosive, neutral and long-lasting metal. They can last a lifetime with proper care. However, implants can incur the same periodontal issues as natural teeth, and require good oral care and regular cleanings at the dentist, just like natural teeth. Once Dr. Radu finishes the implant, your new prosthetic tooth feels, looks and acts just like a natural tooth. Your implant will have full chewing power, and you can eat as you normally would. You can also brush and floss in the usual manner. When Dr. Radu uses an implant to support restorations such as dental bridges and dentures, they’re also very lifelike in look and function. The more implants Dr. Radu uses to support the restoration, the more true to life it is. Bone in the jaw deteriorates where there is no tooth. This is because the bone requires the pressure of chewing to maintain its density. In the first year of tooth loss, if no implant is placed, the bone under the empty tooth socket loses 25% of its volume and bone loss continues over the years. 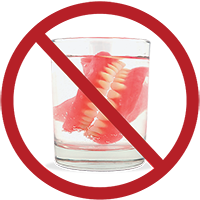 Dentures can even accelerate the bone loss as they are often loose, and rub against the bony ridge, gradually wearing it away. Implants act as natural teeth and provide that stimulation. This is also true for implant-supported bridges or implant-supported dentures. The gap caused by a missing tooth can destabilize adjacent teeth, causing them to shift towards the gap. This pulls your teeth out of position and can affect your bite and your ability to chew. A poor bite can also lead to problems with your TMJ (temporomandibular joint) and may cause headaches and other health issues. Gaps between teeth can act as traps for food and bacteria and can lead to gum disease. Dental implants can also prevent facial sagging for people who have all or many of their teeth missing. Due to progressive bone loss caused by the missing teeth, the height between the tip of the nose and chin decreases, causing the lower third of the face to collapse. Changes include excess wrinkles around the mouth, drooping jowls and sagging skin, thinning lips and a more pointed chin; making the person look a lot older than his or her true age. When tooth roots are not replaced, as with regular dentures, the face can begin to sag as bone mass deteriorates. Dental implants can prevent this from occurring. One of the most frustrating, and most unhealthy, aspect of dentures is their poor chewing power. Not only does this affect a person’s diet, it also leads to bone loss due to lack of stimulation. Which is why even well-fitted dentures will eventually become loose – the bony ridge supporting them starts to shrink away. Implants have full chewing power and promote jawbone health. Dentures often have to be kept in the mouth by using a dental adhesive. An implant eliminates the need for dental adhesive. Dentures have to be removed for cleaning. With the exception of a removable implant-retained denture, your implant-supported restoration can be cleaned by normal brushing and flossing. Dentures cover the roof of the mouth. With implants, there’s nothing covering the roof of your mouth to interfere with your sense of taste or other normal activities. Implant-supported dentures can also be fabricated without the plastic covering the roof of your mouth. Dentures can slip while eating or speaking. Implants and implant-supported dentures are securely anchored and won’t slip. It’s hard to enjoy many foods with dentures. 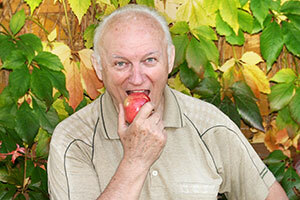 Dentures can move while you chew, and it can be uncomfortable to try to chew many foods you like or need. In fact, dentures generally have only 10% or less of full chewing power. Dental implants have full chewing power and implant-supported bridges or dentures also considerably increase the chewing power. Dentures click while eating. With implants or implant-supported dentures, there’s no annoying clicking sound. Progressive bone loss as a result of wearing dentures can considerably age a person’s facial appearance. Over the years bone loss can cause the collapse of the lower third of your face, creating excessive wrinkles, sagging skin and jowls, thinning lips and a sunken-in look. Implants help prevent this. This is the patient’s own or newly fabricated denture that is fitted with special attachments that snap into two to eight implants per arch. The device can be easily removed for hygiene and snapped back in. Removable, implant-supported dentures provide stability and some increase in chewing ability. In this case, full arch restorations are permanently fixed onto five or six dental implants, even up to eight, only removable by the dentist. Fixed, implant-supported full arch restorations provide about 70% to 80% of normal chewing power. The more implants placed, the more chewing power a person has. Learn more about Stable Teeth Today. For some people, an implant-supported bridge is a superior option because Dr. Radu uses dental implants attached to a series of bridges. This allows pressure to be distributed throughout the entire bridge, reducing the amount of pressure on each individual implant. Implant-supported bridges are very natural-looking and provide a patient with chewing power over 90%. With a dental bridge, the patient’s healthy teeth need to be altered to hold the bridge in place. A bridge consists of an artificial tooth attached to adjacent healthy teeth that have been capped. The main disadvantage of a dental bridge is that the adjacent healthy teeth have to be ground down considerably as part of the procedure. A dental implant is the most conservative tooth replacement method as it doesn’t require any alteration to adjacent teeth. Bridges tend to have short lives, five to ten years, compared to a dental implant which can last a lifetime. So while a bridge can sometimes be more economical initially, in the long run a dental implant can cost you less.